Career Synopsis: Crawford signed quickly after the draft and quickly established himself as one of the best hitters in the GCL with a .345/.443/.465 slash line over 39 games. 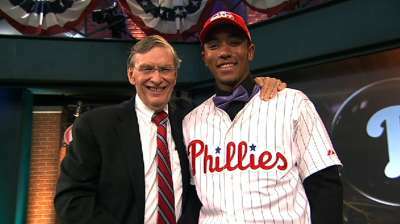 The Phillies rewarded him with a late season promotion to Lakewood where he struggled some hitting only .208/.300/.206. Profile: The defense is the real special thing here. Crawford projects to be better than a plus defender at the major league level, and it shouldn’t be with an empty bat either. He isn’t going to be a middle of the order hitter but there will be some pop and a good average. Beyond the tool grades Crawford has great instincts and feel for the game and the tools could play above their grades. Overall the profile is first division regular, borderline All-Star at shortstop.